Ingrid, daughter of Oswald and Frieda, was born in the Free City of Danzig, in what was then Germany. She came to the United States when she was 6 years old and settled into the Greenpoint section of Brooklyn, New York. It was there she met the love of her life, John Saro. After they got married she moved 2 doors down and lived on the same street for 62 years. She enjoyed walking around The Avenue daily. Together, they raised 3 children and she happily was a stay at home mom and housewife, who put family first. Ingrid had a love of the arts: she loved to oil paint, collect antiques, the ballet, and was fond of many different kinds of music, her favorites being Johnny Cash and Elvis. Nearly every Sunday, she and John could be found enjoying a “ride” to the countryside, or to upstate NY or CT to visit her family. 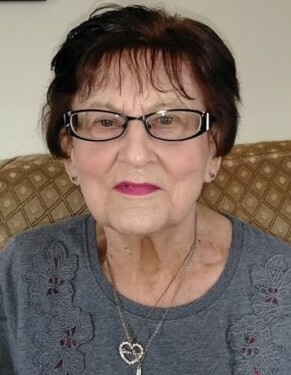 Ingrid eventually moved to Connecticut with her daughter, Cyndie Phillips, in 2011. She spent the last 3 years residing at Cherry Brook Health Center in Canton. She was predeceased by her husband John, youngest daughter Valerie Rosado (Tommy) of Queens, NY, her only 2 grandsons, Michael Saro of Goodview, VA and Brian Phillips of Torrington, CT, as well as her sisters Jenny Hudson of Fishs Eddy, NY and Helga Tavernite of Queens, NY, and her two fur babies (dogs) Pepe and Heidi. Ingrid is survived by her son Gordon Saro (Dolores) of Goodview, VA; daughter Cyndie Phillips (David) of Torrington, CT; grandaughters Desirae Whittle (Bill) of Meriden, CT; Katelyn Gonzalez (Israel) of Torrington, CT and 6 great-grandchildren: Connor, Braedan, Ingrid, Madison, Samuel and Sophie. Ingrid will be remembered for her Brooklyn accent, her unapologetic sass, her love for jeans and jewelry and most recently her love for men with beards and/or tattoos. Her family will most remember her generosity, tight hugs and her smile, which she was rarely seen without. The family would like to thank the staff of Cherry Brook Health Care in Canton and MacLean Hospice of Simsbury, CT.
Funeral services will be held Saturday, March 30, 2019 at 4:00p.m. at Gleeson-Ryan Funeral Home, 258 Prospect St., Torrington. Friends may call Saturday afternoon from 1:00 to 4:00p.m. at Gleeson-Ryan Funeral Home. Burial will be held at the convenience of the family.